Is King Abdullah bin Abdul Aziz of Saudi Arabia ‘Clinically Dead’? Today, Saudi state television showed images of King Abdullah meeting with senior government officials after he underwent a complicated back surgery on 17th November at the National Guard’s King Abdulaziz Medical City in Riyadh. A day after the operation the Royal court said, the surgery was “successful”. The televised images showed the king with Crown Prince Salman bin Abdulaziz the defense minister of Saudi Arabia and heir to the throne, Saudi Foreign Minister Saud al-Faisal and other senior princes and officials. 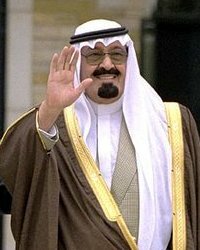 King Abdul-Aziz bin Saud founded the Kingdom of Saudi Arabia in 1932. After his death in 1953 the crown passed down through a line of sons. Since 2005, King Abdullah bin Abdulaziz has been upon the throne. The king was born in Riyadh in 1924, the 13th son of Abdul Aziz. Saudi Arabia is the largest Arab state in Western Asia and the second-largest in the Arab world, after Algeria. Home to the two sacred places in Islam – Al-Masjidal-Haram in Mecca, and Al-Masjid al-Nabawi in Medina, the kingdom is sometimes also known as “The Land of the Two Holy Mosques“. The Saudi Arabian government has been Islamic and an absolute monarchy since its inception. Saudi Arabia has the world’s second greatest and more than a fifth of world petroleum reserves, which account for 95% of exports and 70% of government revenue. It also has the world’s sixth largest natural-gas reserves. The Kingdom of Saudi Arabia is the biggest U.S. ally in the Gulf region. Yesterday the Saudi stock market index dropped to a 10-month low closing 1.3 points lower. Previous PostBlood Red Beach Gets (Almost) Everyone Out of the WaterNext PostEarthquakes Trigger More Earthquakes: Imminent Magnitude 9 Earthquake?